It might only be March, but we surely saw The KO of The Year last night in New York. 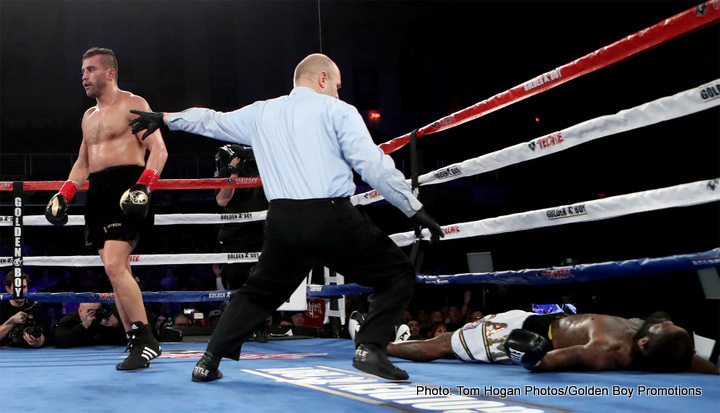 Fans were braced for something special as soon as the middleweight collision between David Lemieux and Curtis Stevens was signed – and did the fight deliver! The two heavy-handed bangers, who had exchanged plenty of trash-talk in the run-up to the battle, went at it right from the opening bell; the faster, sharper Lemieux getting much the better of it. Stevens was content – or maybe he simply had no other choice – to cover up and attempt to weather the storm, coming to life more in the second round when he got home with some decent shots of his own. Stevens’ counters were somewhat effective and it was whilst trying to counter with a left hand that Stevens was tagged with THE punch of Lemieux’ career. Caught as he had his back to the ropes, Stevens was vaporized by a Lemiuex left hook that landed a split second before his own left landed. It was over instantly, Stevens laid out flat on his back and motionless. It was one of the scariest KO’s you’ll ever see. Lemieux, who was reluctant to celebrate too wildly having hurt his rival so badly (thankfully Stevens, 29-6(21) was okay, speaking to members of his family as he was stretchered out of the ring) is now in line for another big fight. It’s unlikely the former IBF middleweight champ will ever get a shot at revenge against 160 pound king Gennady Golovkin, but another big fight looks likely for Lemieux soon. That’s what happens when a star fighter scores a highlight reel KO the likes of which we witnessed last night. Indeed, when The KO of The Year awards are handed out at the conclusion of 2017, chances are incredibly high Lemieux, 37-3(33) will be presented with the accolade. Only a sadist would hope to see a more savage knockout. How many You Tube hits will Lemieux KO3 Stevens get! Next boxing news: Did Yuriorkis Gamboa fail his audition for a Vasyl Lomachenko fight?